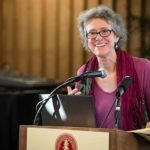 Arlie Russell Hochschild is an American sociologist and academic. She is professor emerita of sociology at the University of California, Berkeley. Hochschild has long focused on the human emotions which underlie moral beliefs, practices, and social life generally. She is the author of nine books including, most recently Strangers in Their Own Land: Anger and Mourning on the American Right, a finalist for the National Book Award, and The Second Shift, The Managed Heart, and The Time Bind. In the tradition of C. Wright Mills, Hochschild continually tries to draw links between private troubles and social issues. "Many women cut back what had to be done at home by redefining what the house, the marriage and, sometimes, what the child needs. One woman described a fairly common pattern: I do my half. I do half of his half, and the rest doesn’t get done."